you risk licking the dish! Mix all the ingredients. Marinade the chicken 2 hrs. or over night. Stick the chunks of chicken on the kebob sticks and grill 15 minutes or until cooked. In the meantime puree the marinade in a food processor and heat.in a double boiler, stirring continuously. 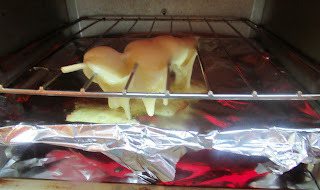 If not the mixture will curdle due to the lemon juice. Pour this in soup dishes and place the kebobs on top. Sprinkle with garnish and serve. 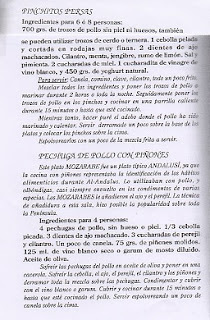 As Benavides-Barajas does not document his sources it is unknown where he found the original recipe but this is recipe is quite novel, delicious and in keeping with the Hispano-Arab culinary tradition. broquetas, brochetas, OCat bastonets, Cat broques, Eng. kebabs, U.S. kabob. In Arabic, the same word “kabāb” or “kubab”, is not necessarily pieces of meat grilled or broiled on a skewer or spit but can be meatballs. The earliest known documented recipe is from the 10th C Kitab al-Tabeekh (Book of Cookery) written by Ibn Sayyar al-Warraq from Baghdad. He titles it “Kebab Khalis.” It consists of salted, sliced lean meat that is grilled in a frying pan without grease or oil. 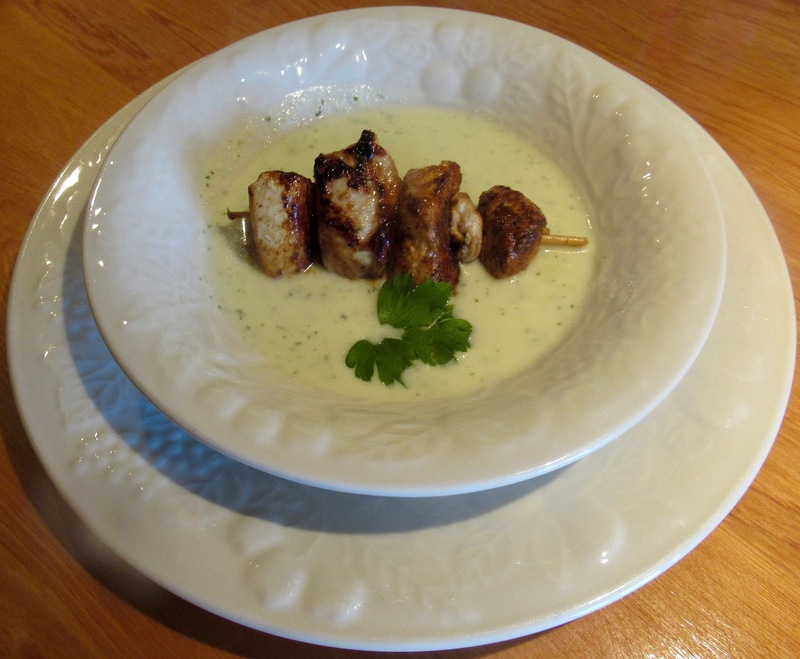 In medieval times Persian kings ate them but commoners only ate kabobs on Nowrooz, the Islamic New Year. Benavides-Barajas provides a recipe of barbecuing chunks of semi-hard cheese on spits and dipped in olive oil before cooking. 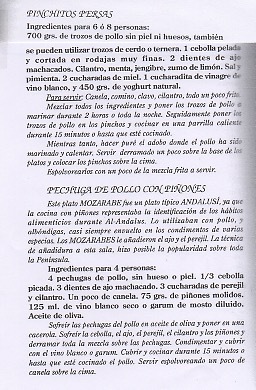 See espetar and pinchos de carnes. Cut cheese in chunks. Put them on a wooden kebab spit. Roast over coals until browned. 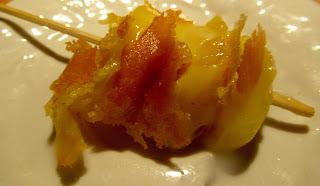 Remove from sticks and serve warm. Other spices could be cinnamon, ginger and nutmeg.